After last section’s wormhole dancing time-twisting backwards-yet-forwardly presented hike, I was eager to get back into the woods for some good old fashioned North to South up and down hiking. And that’s exactly what I got on this very warm, very humid Friday afternoon. With the temperature in the mid-90’s and sweat pooling on my brow before I even turned my camera on, my car-spotter Lisa left me with a look of dire concern. Oh Lisa, don’t be silly. I know what I’m doing. 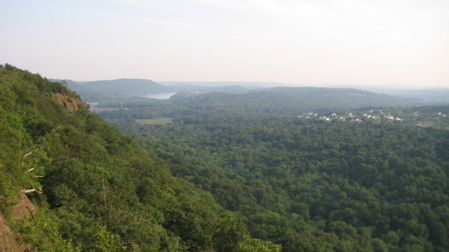 At that, I confidently trudged down Route 147 away from Guida’s Diner (home of a “best of” Connecticut hot dog) and into the woods and… um… where are the blue blazes? Yeah, I’m a real pro. I simply bushwhacked in a northwesterly direction and quickly found the trail paralleling Route 66 to gradually ascend the Beseck Ridge. 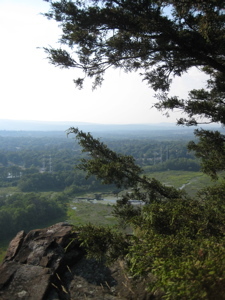 This hike took me less than two hours and while it contained several very nice views, some wild turkeys, some deer, and a few other cool things we’ll get to, it’s not like this is top Connecticut woodland drama. So, I figure this would be a great time to discuss something really cool only a mere minute or two from this hike’s trailhead. 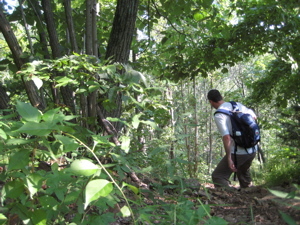 So just bear with me as I quickly ascend the ridge through some typical young Eastern forest land in central Connecticut. The Connecticut Forest & Park Association (CFPA) is the wonderful organization that maintains the state’s 825+ miles of blue-blazed trails, publishes the indispensable Walk Books, and is constantly fighting the political fight on behalf of our public lands. Their headquarters is in a place called Rockfall. Since you’ve never heard of that either, it’s actually an unincorporated village comprising the northern section of the town of Middlefield. 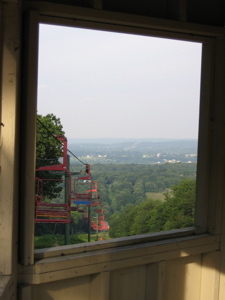 It is located in a handsome building right down Route 66 from the Mattabesett crossing AND it’s open for visitors! 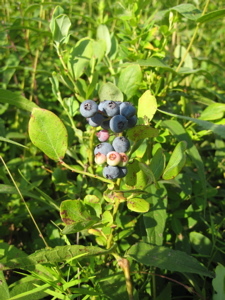 And powerline cuts provide edge habitat for delicious and bountiful blueberries! As always, I lolligagged here and scooped up handfuls of the berries and gulped them down. 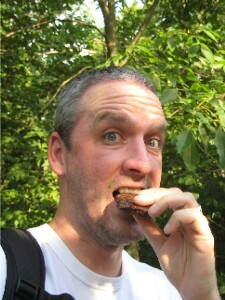 Since it was so blazing hot it was like I was eating a hot blueberry pie! Do you see how I can find the positive in everything while hiking? 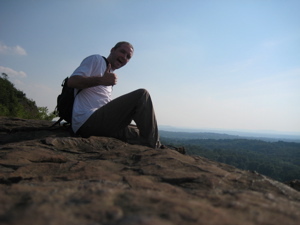 Since this is a Mattabesett section hike on Beseck Ridge, there are a few photos I must include to make it official. 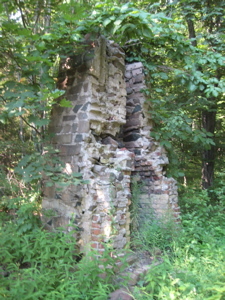 One is of the old chimney just before the Black Pond overlook. Shortly after the chimney were the views of Black Pond. That’s Route 66 across the way and of course Higby Mountain beyond that. Did you know that the CFPA Walk Book description of this nearly six mile section is perhaps the shortest of any section of any major trail in the state? Oh those CFPA folks – I wonder how their headquarters is doing? It’s doing great. During my visit I wound up speaking with a really cool woman about – well, about exactly what you’d expect me to speak with her about. Trail conditions, trail re-routes, property battles, trail maintenance, various publications, ATV jerks… On and on we went, as if we’d known each other for years. She was great and I’m happy to report that their new website is great too – Check it out. 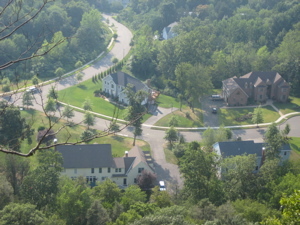 Back to the hike at hand… While making my way down the ridge into Wallingford, I found myself high above suburbia with the whir of weed-whackers in the air. I don’t mind the visuals of new houses and roads, but for some reason the sounds of central air units and lawn mowers does bother me for some reason. 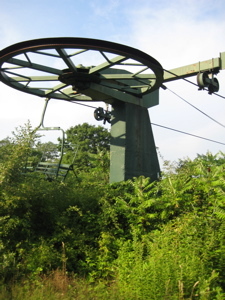 On the other side of Beseck Mountain is the defunct Powder Ridge ski resort. I can’t recall how many closings this place has suffered through; I do recall one warm/snow-less winter where they were just hemorrhaging money a few years ago. So they closed up shop… one week before a March blizzard brought a couple feet of fresh snow. So they opened up again, only to close for good the next year I think. 2019 Update: Yes, it’s open again and has been for a few years. Ghost towns are one thing… Ghost ski resorts are another. 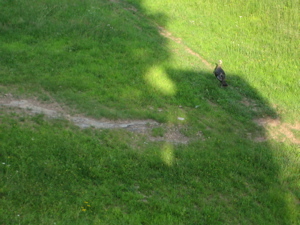 While standing up in the gate house thing, I saw a bunch of turkeys down below, doing what turkeys do. But by the time I got my camera out and ready, they dispersed. This was only interesting in that the four of them all went in four separate directions – I know they say turkeys are intelligent, and I can verify that their predator response is certainly thus. I didn’t know which turkey to follow to get a picture, and in that decision making delay, they all pretty much escaped. Brilliant. Mmmm… I’m going with bobcat. 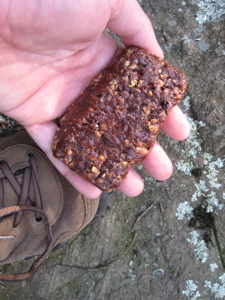 Seriously, those “energy” bars really don’t look very appetizing. 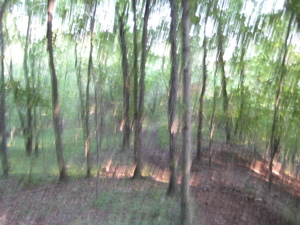 But it gave me the energy I needed to continue down the trail. There are a ton of viewpoints along the ridge and this one is one of the first true shots looking due south towards the Long Island Sound. 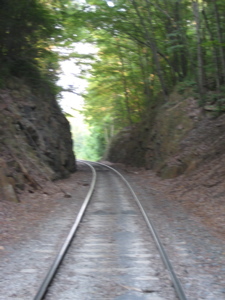 Someday in the new few years, the CFPA plans to blaze an arm of the Mattabesett south to the Sound, through Guilford. 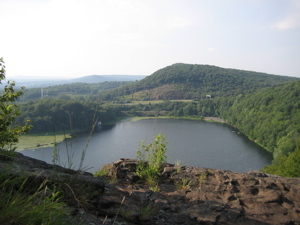 Once complete, one would be able to hike up through Connecticut from the beach in Guilford, to the Metacomet Trail to the Massachusetts border, continuing up to New Hampshire where it connects to the Monadnock Trail and from there, one can continue up to Quebec if one is so inclined. So yeah, that’s pretty cool. 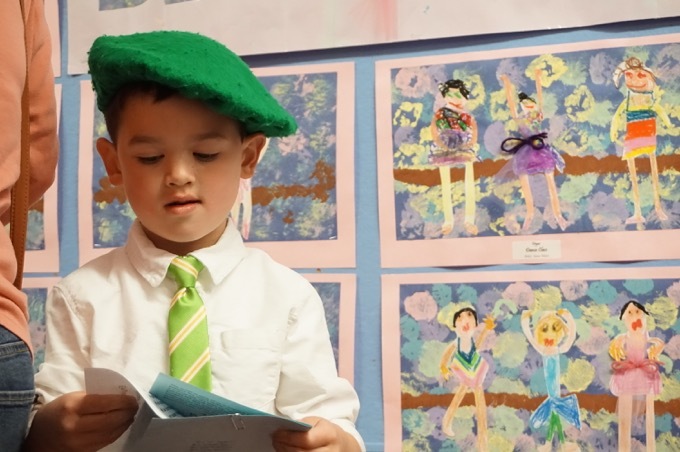 2019 Update: My how time flies. The trail to the Sound was blazed and is called the Menunkatuck. 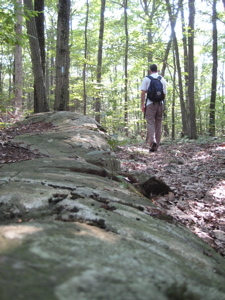 The New England Trail was designated by the US Congress and includes the 3 M trails. 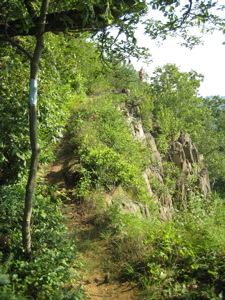 After several miles of ridgewalking, the trail turns east and heads down to Reed’s Gap and Route 68. “Reed’s Gap” sounds so impressively southern Appalachians, doesn’t it? I thought we mainly had notches up here… Anyway, As I began crossing the the little plateau before the descent, I heard a locomotive approaching. I had about 3/4 of a mile to go, but it was flat and downhill. And the train seemed forever-long. The smell of diesel wafted up through the woods as I got closer and closer. “Wow, what a great picture opportunity!” I kept telling myself. Alas, I didn’t quite make it. 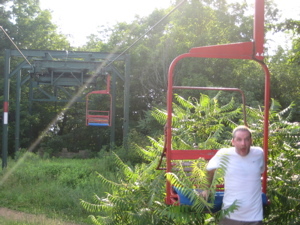 Just as I reached the bottom, the train was out of sight. I touched the tracks to see if they were hot and they were… I guess. 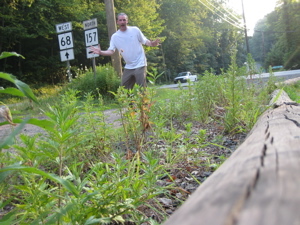 Oh well… The trail crosses the tracks and then pops out onto the rather busy Route 68 and makes a left-hand turn towards Route 157 and the nice parking lot that held my car. I’d been Besecked! Being, well, being an ecoconscious guy, I picked up the litter (as well as a bunch of cans and bottles, mind you) and took it home to properly dispose of. Hoang didn’t share my excitement at being besecked, however. Oh well. 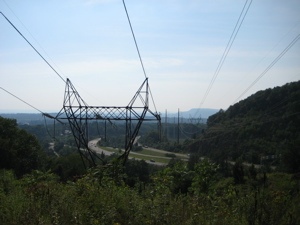 This is a fun section that requires minimal effort to attain maximal views; a theme on the western arm of the Mattabesett. May you and yours have as much fun as I did, please visit/join/volunteer for the CFPA, and hopefully you’ll be rewarded with some besecks as I was. Ahem. I enjoyed the entry. Just a point of fact-its Reed’s gap, not Reed gap. It was named after a family from Middlefield way back when. Hi. Enjoy your stories. 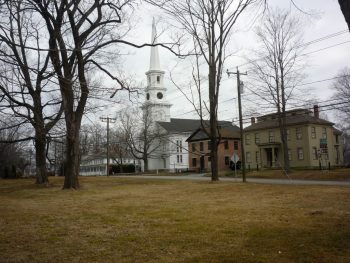 Do you have any information on Connecticut ghost towns and buried treasures. Please sent information to: tippy1804@att.net.